Want to make your yard more sustainable and wildlife friendly, but still want a soft patch of grass to play on? Plant clover! You can either mix it in with your current grass or have a completely clover lawn. Clover requires zero fertilizer or herbicide and little to no mowing or watering. Meanwhile it improves the soil, attracts bees, butterflies and other beneficial bugs for your garden. And, it’s even softer to sit on than grass! It was pretty universal for Americans to use clover in up through the 1940s. Then people started using herbicides to kill off dandelions, plantain and other broadleaf “weeds.” Clover was a casualty. 1. Nitrogen fixer. As a legume, clover works symbiotically with bacteria to fix atmospheric nitrogen and make it available to both itself and neighboring plants. That’s why even lawn grasses grow better when clover is present. 2. Less fertilizer. A lawn containing clover needs far less fertilizer, and a 100% clover lawn needs none. 3. Drought Resistant. With its deep roots, clover will remain green through drought, as your neighbor’s lawns turn brown. 4. No mowing. A pure clover lawn doesn’t need mowing, but if you do decide to mow, you’ll only need to do so 3 or 4 times a year. 5. No aerating. Clover can grow in and loosen compacted soil, eliminating the need to aerate. 6. No herbicide. 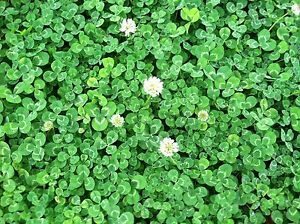 If you’re concerned about a uniform looking patch of green, you don’t have to worry about other “weeds.” Clover tends to smother them as is somewhat invasive. 7. Ground cover. Clover makes an excellent ground-cover for food crops. 8. Beneficial pollinators and wildlife. 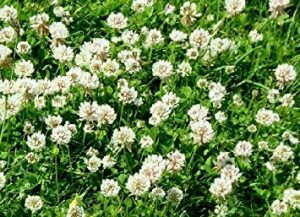 Clover produces attractive white flowers that attract beneficial pollinators likes bees and butterflies and provide forage for rabbits (and humans). 9. Repels pests. 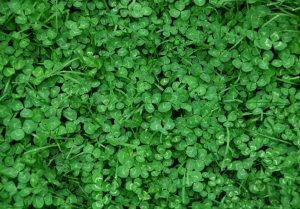 A lawn rich in clover tends to discourage pesky insects, most of which prefer grasses. Grubs will disappear entirely in an all-clover lawn. 10. Sun or shade. Clover grows well in both sun and partial shade. 11. Dogs can pee on it. Clover doesn’t turn yellow when dogs pee on it. As a compromise, Slater recommends planting native wildflowers, bushes and trees around a plot of clover on the edges of your property line. If enough people did this, our yards could serve as corridors for wildlife to move back and forth between parks and other natural areas nearby. I love the big patches of clover we already have in our yard – how do I get it to “take over” and replace the lawn? Do I just sprinkle seeds over the lawn? Will it eventually kill off the grass? Thanks for the info! I will definitely plant my clover seeds in the fall, in Southwest Florida! I like the idea of clover for a lawn. Especially, the softness to walk on, plus for children to play on. Also, being one who grew up on a farm, it brings back good memories. Plus, less work is a great thing, more time to spend with family and friends. Thank you!! Hi Sara, will a clover-lawn grow under shaded trees? We have a really shaded area in our garden where we’d love to have a lawn but grass doesn’t grow. Clover looks ideal if it will grow in shaded areas. Is it invasive? Can I stop it from spreading? James. I’ve grown clover in Concho, AZ outside of Show Low which is in the same zone. I was just using it as ground cover in my raised beds. We get higher temps but it will grown. So how do you prepare your old, packed dirt, weedy backyard to achieve the clover “lawn”??? Please reply to this question, I also want to know this. Cover the area with thick card board and weigh it down so it doesn’t blow away. After 3-4 weeks the grass underneath should be dead. Add some bio charcoal and rock dust/minerals and dig it in cardboard and all. Plant out with clover seed or transplant from someone else. You may need to water the cardboard to soften the ground if it’s really hard. You could use old carpet too so long as it’s natural fibre. Don’t kill your grass with round up/glysophate. It will poison your soil for years which ain’t good if you want to eat the clover. Good luck. It’s also trial and error too sometimes…. If I clover seed my yard will it stand up to dog traffic??? I have 3 but up to 5 dogs running through my back yard at times. Just wondering if clover is the thing to do?? Would like to know the answer to that dog question too. Mow what’s there down twice in as many weeks as low as you can the second time. This will exhaust the weeds’ energy and push any grasses into temporary dormancy. Work the soil as little as necessary to get seeds germinating. A spring rake or chain drag behind a small tractor or quad should be enough to scratch furrows into which seed could be broadcast or hire someone with a small no-till seeder. You could till, sow and cultipack if you have the time, equipment and money but it’s not necessary or best practice except in the most compacted soils. Fertilize with pulverized granite, bone meal and kelp or compost tea. Clover uses nodules of symbiotic bacteria in its roots to sequester nitrogen from the air so the ground should be inoculated with a culture for best results. One may make a compost with spoiled alfalfa hay to inoculate. I spread hay over winter paddocks and get new seedlings from the hay germinating under the light mulch in the spring. We had lots of clover growing up in Illinois but only see s few wild ones here in Texas. Will clover grow in this Texas heat temps up to and over 200?? We’re on a little over an acre … all lawn and trees. Would we have to pull up the lawn or can we throw clover seed down and it’ll eventually take over? We would need to continue mowing the lawn until it was mostly clover … would that kill the clover? Does it grow in region 7 (North Carolina.? Great . . . thanks for that “headsup”. Willl do exactly that with the new house I’m building in the spring. Will clover grow under pine trees? Plenty of good questions. Where are the responses to these questions? what are the species varieties recommended for lawns in zone 5? Does it mix well with other non-grass alternatives like thyme? I live in Las Vegas… will it grow there? So hot in the summer. I was thinking of planting buffalo grass for next season as I let my lawn die in the back and added xeriscape in the front. This cut my water bill by 50% this year! I went to Youtube for buffalo grass and will now look for clover which sounds much less expensive than buffalo grass. Can clover handle the 110 summers of Las Vegas? Can I put out seed in the fall? I’m moving into new construction and the grass is just getting established. Can I over seed with this clover?